Forget about the line from real estate agents about a home being a great investment or your biggest asset. Your home is a purchase. An expensive purchase. By the time you pay interest (even though you can get a tax deduction), property taxes, maintenance costs, repair expenses, insurance and utilities, the expenses really start to add up. Even if you do sell your home for more than you paid, it may not be enough to offset the accumulated expenses associated with owning a home for decades. 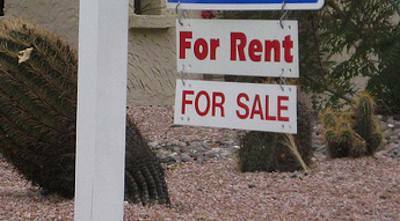 Renting, on the other hand, is usually less expensive. You aren’t responsible for the repairs or maintenance costs (unless you do something you shouldn’t), renter’s insurance is much cheaper than homeowner’s insurance, and you don’t have interest or property taxes. Depending on the market you’re in, a rent payment for a decent-sized home may be a couple hundred less than a mortgage payment. Some folks like to invest the difference, hoping for a better long-term return. If you aren’t going to be an area for very long, the flexibility of renting might be attractive. Aside from having to sign a one year initial lease, renting offers the ability for you to pick up and leave if you need/want to. We had hoped to be in our current home for a longer period of time, but, like so much in life, it isn’t working out. We will probably have to move to a new town, and that means trying to sell this house. If we were renting right now, we could just offer 30 days’ notice to the landlord and leave when ready. And, because we don’t want to be landlords, we will probably have to take a loss on the home when we sell it. ready to buy a home, and we might not rush into it in the next place we live. While we can afford to live in the house, the responsibility of it, and the expense associated with it, can be irritating at times — especially when I think that we are likely to be moving after staying in the home for less than five years. In the end, carefully weigh the pros and cons of buying a home versus renting it. Think about what is likely to happen in the future, and whether or not the money you put into home ownership might be better used elsewhere. You missed one important advantage; if anything that was in the house before you breaks, the landlord has to take care of it. Broken heater, broken stove, broken fridge, broken dishwasher, fallapart roof, even if an ice storm knocks every branch off every tree in your yard, & they can’t raise your rent over it. If you are having a hard time paying rental fees or can’t afford to buy a house, then there is an option called lease to own or also known as rent to own. In rent to own you are paying more higher than a rental fee but after the contract the house is yours. What makes you think renters aren’t paying mortgage interest or property taxes? They’re built into the rent we pay rather than a separate line item in the budget. A few years back when my city lowered the property taxes in my neighbourhood, our rent went down accordingly. I think as renters, it’s important to understand what our rent actually covers so we can make more accurate comparisons. For example, my rent covers outdoor maintenance — if I bought a condo, that would show up in the condo fees. If I bought a house, I’d DIY or have to pay someone to do it. The point is that what’s a “hidden cost” to me now would be a cost beyond the mortgage payment. In other words, the you’re paying X for rent, therefore you can afford X for a mortgage payment logic people keep throwing at me just doesn’t fly. Good point that renters are paying their landlord’s property taxes. But what makes the difference is that in a multi-unit building, taxes are split between several households. If you own a house, they’re all yours. Renting is definitely nice when things break or you’re young and likely to move. Life passes pretty quickly however and I’ve know more than a few people who wound up renting one place for 10 to 12 years when all of those rent payments could have been building equity and deducting mortgage interest. I agree that there can be times when renting is more advantageous but isn’t the ultimate goal to own a house freehold and have an asset for retirement? After owning 3 different homes I find renting our current house so much easier. We save a lot of money, we do not have to worry if major things break down, and we do not have to worry about whether or not the price of the house is going up or down.